Check out this nifty helmet! Skully helmets (@SkullyHelmets #iwantskully) have Bluetooth and 180-degree rear view, as well as GPS, on a head-up display. One of the deadliest errors drivers make is called “Expectation Bias.” We see what we expect; and we fail to see the unexpected. 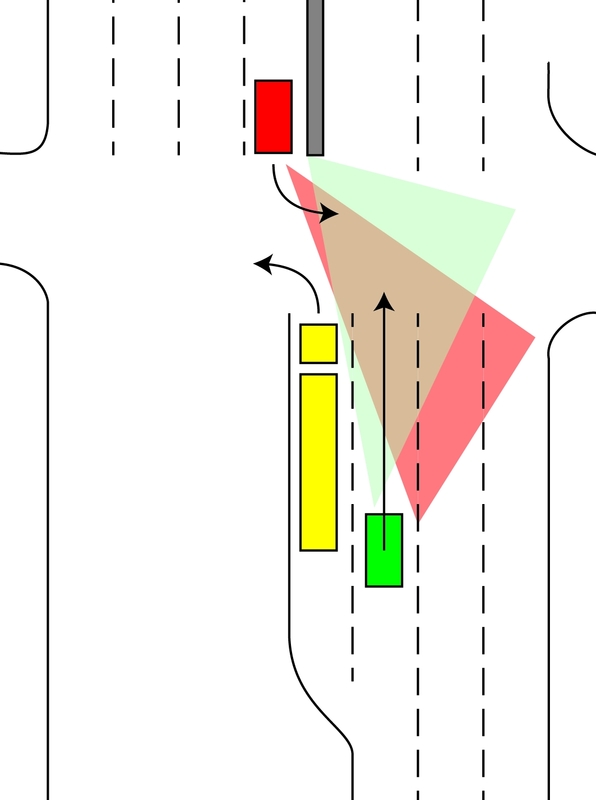 I witnessed an accident last week, which perfectly illustrates the problem of Expectation Bias. In fact, I was very nearly involved in it myself. The driver who caused the accident was Westbound, but turning Left, to the South. The other driver, directly in front of me, was going straight through the intersection. An Eastbound tractor-trailer was in the left-turn lane, waiting to turn North. Because of the position of the left-turn lane, the tractor-trailer blocked the view of each of the drivers involved in the accident. The lady who was turning left looked at the intersection and it appeared to be clear, except for the truck which was waiting to turn left, opposite to her. The other lady, passing the tractor-trailer, could see that the intersection was clear in front of her, but because of the tractor-trailer, she couldn’t see the SUV that was preparing to turn left, in front of her. My illustration shows the 3 vehicles, and the field of vision of each driver. Either driver could have avoided this accident, if they had recognized the hazard presented by the tractor-trailer. Each of them should have had mental alarms going off: “Danger, Will Robinson!” Rather than looking for the hazard, they were looking for a clear intersection, and that’s what they saw. They were victims of their own expectations. Expectation Bias is a real threat to motorcyclists: Other drivers, expecting to see cars or trucks, fail to see motorcycles, even when they are in plain view. A friend of mine was struck by his neighbor (a biker himself), who said that he actually saw the motorcycle, but it failed to register. How many of us get further into debt than we can afford, because we have such a rosy view of the future? We expect everything to work out fine, so we whip out the plastic. Expectation Bias strikes again! As a rider, one of the most important safety lessons is learning to see hazards everywhere. Expectation Bias is a threat to our ability to recognize hazards; we also need to recognize our expectations (and the expectations of other drivers) as a potential hazard. One of the fellows who taught me to ride told me that I should always pretend I was driving a Semi. “Learn to occupy as much space on the road as a tractor-trailer rig; Don’t let anyone get inside your space.” We overcome other drivers’ expectation bias by making ourselves more visible and audible, and by forcing them to treat us like a larger vehicle.